What the well-dressed Texas gal will wear during the current heat wave might be something quite novel. 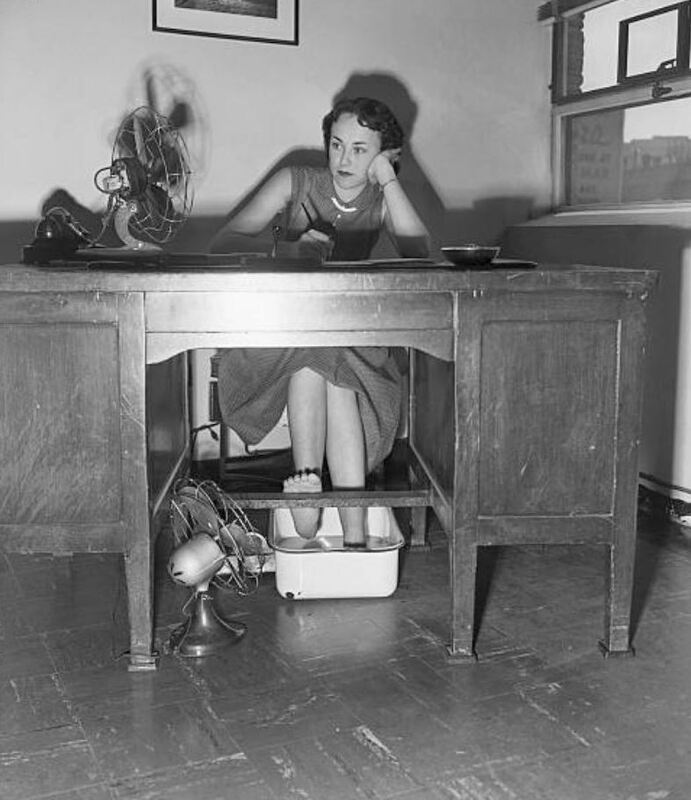 Here, Dallas secretary Mildred Walston starts a new trend in her efforts to keep cool. She uses two fans and a cool pan in which to slosh her feet. Later in the afternoon, Aug. 14, when the temperature hit 103 degrees, Mildred’s boss broke down and sent her off to the nearest swimming pool. Mildred Walston Fulenwider (1915-1962) worked for many years in the motion picture business in Dallas and was a founding member of WOMPI (Women of the Motion Picture Industry), organized in Dallas in 1952. I’m going to have to remember that fan-pointed-at-feet-soaking-in-pan-of-cool-water trick. Photo from the old Bettmann/Corbis site.